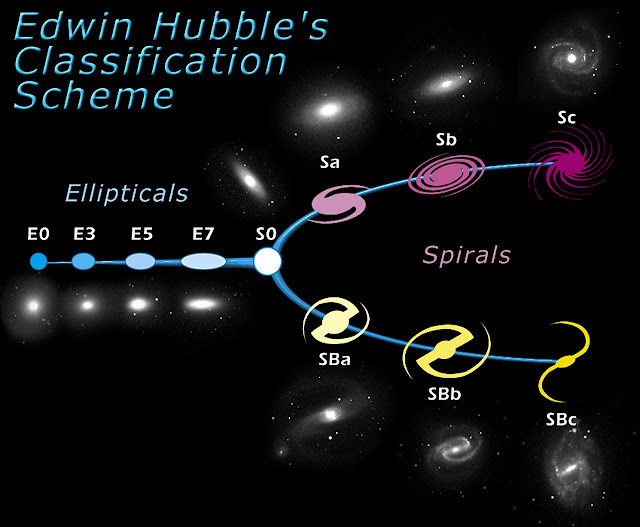 Galaxies are classified through a system devised by Edwin Hubble known as the Hubble Sequence. 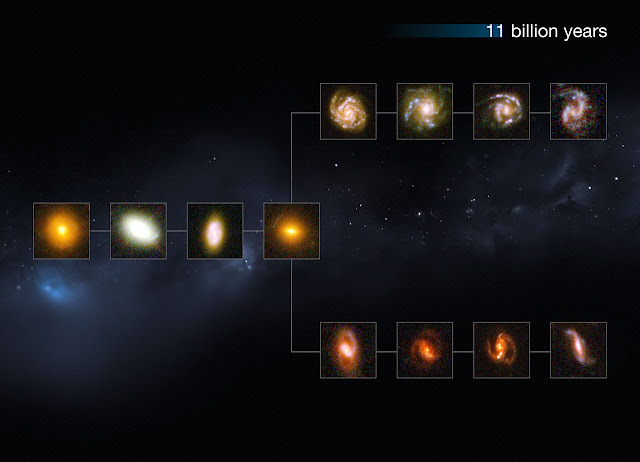 With the help of Hubble Space Telescope (named after the astronomer himself) and the Cosmic Assembly Near-infrared Deep Extragalactic Legacy Survey (CANDELS), data helped visualize the Hubble Sequence 11 billion years ago. 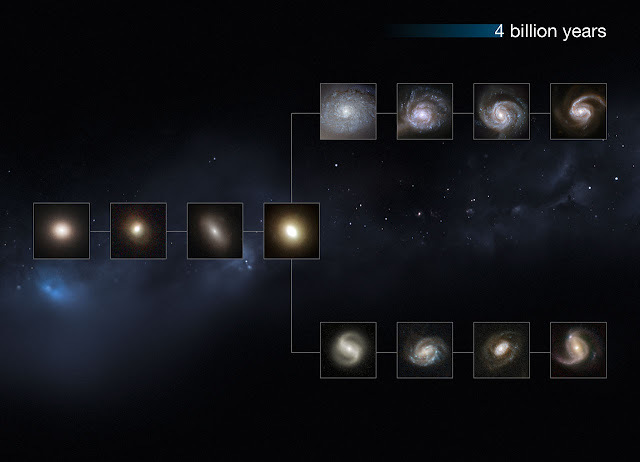 Previous data has shown the Hubble Sequence of the Universe 8 billion years back. The size, shape, form and even color of galaxies before are different from how it looks like today (see images at end of article). The physical formation has changed and are still changing and developing. Using two cameras aboard the Hubble Space Telescope, the Wide Field Camera 3 (WFC3) and the Advanced Camera for Surveys (ACS), CANDELS is set to explore the evolution of galaxies in the Universe and collect data that can give a glimpse of the Universe 1 billion years before the Big Bang. Previous data were limited to the visible light spectrum which shows only the redshifted ultraviolet emission of the galaxies, which highlights star formation. By looking into the infrared spectrum of light (invisible to the human eye), the astronomers could observe how these distant galaxies appear in their visible rest frame (which is now redshifted), making it easier to compare to nearby galaxies. While it was known that the Hubble Sequence holds true as far back as around 8 billion years ago, these new observations push a further 2.5 billion years back in cosmic time, covering a huge 80% of the past history of the Universe. Previous studies had also reached into this epoch of the cosmos to study lower-mass galaxies, but none had conclusively also looked at large, mature galaxies like the Milky Way. The new CANDELS observations confirm that all galaxies this far back — big and small alike — fit into the different classifications of the sequence. The galaxies at these earlier times appear to be split between blue star-forming galaxies with a complex structure — including discs, bulges, and messy clumps — and massive red galaxies that are no longer forming stars, as seen in the nearby Universe. 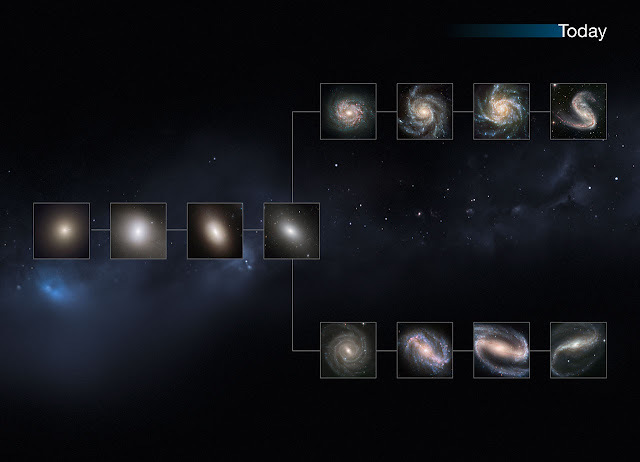 What was needed was a systematic set of observations such as those from Hubble's CANDELS survey, which was large enough to allow the astronomers to analyse a larger number of these galaxies consistently, and in detail. With Hubble's Wide Field Camera 3 (WFC3), the astronomers were able to observe in the infrared part of the spectrum to see how the galaxies appeared in their visible rest-frame, which is easier to compare with galaxies in our neighbourhood. The images show a "slice" of the Universe from 11 billion years back in time up to today. The shape is that of the Hubble tuning fork diagram, which describes and separates galaxies according to their morphology into spiral (S), elliptical (E), and lenticular (S0) galaxies. On the left of this diagram are the ellipticals, with lenticulars in the middle, and the spirals branching out on the right side. The spirals on the bottom branch have bars cutting through their centres. The galaxies at these distances from us are small and still in the process of forming.